Free delivery to most UK mainland postcode areas. Any door shipping to mainland UK has no additional shipping cost applied with just a few post code exceptions, ask for details. Want to export your purchases abroad? We can deliver to any port or airport on the UK mainland, contact us for advice! Availability timescales against any product is treated as "WORKING DAYS", we will contact you when products are ready for dispatch. Next day delivery is available on 1000's of products, ask for details. Most doors delivered within 48 - 72 Hours to most UK mainland post code areas, Highlands, Islands and exports by arrangement. Any order, large or small will have a minimum £70 added to some highlands post code areas, a £100 charge added in the shopping basket for UK Islands and Northern Ireland but most Islands will be £100 to £150; it is a one off charge and not per item. So if you are ordering multiple internal doors or external doors the charge doesn't increase in relation to the number of doors ordered. Delivery prices for orders that are for accessories only (i.e. no doors) are based on the total order weight. The prices shown are inclusive of packaging. The levy of a delivery charge listed above does not necessarily mean an order has the weight corresponding to that price. In some instances, the actual load may be above/below the weight-band, but reflects the postage and packaging cost incurred. V.A.T. at the current rate added to all prices. If you prefer to order by phone please call us on +44 (0)1968 671 681 but with the following restriction, we will only accept payments by phone up to a maximum of £200 including vat and only to the billing address associated with the card, anything over this amount will only be accepted by BACS (bank) transfer, easy to set up and totally safe for both parties, this is to prevent fraud and misuse of credit or debit cards. Security starts the second you look at any DirectDoors.com page, on every page from beginning to end and not just as other e-commerce sites where the security is concentrated on the payments page, you can see that we take your enquiries seriously, the web address bar always starts off with "https" showing the page as secure, we use SagePay for one good reason, their security screening is second to none. We deliver throughout the U.K. Mainland using our own dedicated national distribution courier based in England, we deliver direct to your home or your project but you must be aware that the delivery is to your front door, not inside the home or taking the goods up flights of stairs in the case of flatted dwellings, please make sure you have sufficient help or equipment for offloading doors especially larger quantities or heavier products. We also deliver to all UK Islands off the mainland, an extra charge of £100-150 + VAT per full door order will be added to your shopping basket. All Island deliveries may take an extra 7 days on top of the availability timescales advertised throughout the site. We deliver anywhere on the UK Mainland for the prices shown, no hidden extras whatsoever! Our courier will confirm delivery with you but only when the goods are ready for our courier to collect from our depot, there are occasions when our goods are sent straight from our suppliers, in these instances they may not always give you as much notice as our private courier would, we simply ask that you work with them to receive your goods as quickly as possible. Using our courier: We have a weekly delivery service throughout U.K. Mainland and by arrangement as referred to above to the islands, please note that when you are contacted by our courier they will email their contact details, they will arrange the date with you the customer. The courier will only contact you when the goods are ready or we will contact you when we expect a delay which would take the order beyond the delivery timescales mentioned on our web site, we never just arrive without you agreeing the delivery day. When the courier has made contact please note their contact details and DEAL DIRECTLY with them to ensure a smooth delivery experience. Please do not arrange your carpenter until you are certain the goods have arrived, have been checked and are suitable for installation as you intended. Check your delivery, very important! All goods must be checked upon arrival for defects, damage, shortages or unsuitability, in the case of possible damages where the doors or frame are totally packaged or where time will not permit the goods being unwrapped please read the following, all the aforementioned issues must be expressed to our agent (courier driver or 2nd man) immediately, please do not sign for goods without checking for defects, any slight damages or shortages as your signature is acceptance of the goods being received in good and serviceable condition and in the correct quantity, drivers may insist on a signature but please mark "damaged" in block capitals if the driver insists on your signature, we cannot accept any claim for these damages or shortage issues after you have signed for the goods without the above notation. Failure to accept pre-arranged deliveries which are then cancelled by you or have to be re-scheduled due to a change in your delivery requirements will incur an additional transport charge. The additional transport charge will be £40 + VAT on the order for deliveries which have been accepted by you, the customer, for delivery and which are subsequently cancelled or delayed by you. Our site states "Free Delivery" but this will not be the case if we have to re-schedule your delivery. Please advise us of any access problems such as narrow lanes etc that may restrict delivery to your address, some of our trucks are 28ft long, 9ft wide and 12ft high, we may require assistance with the offload of your purchases especially if they are a heavier item. Discounts are available for bulk purchases, "new build or renovations". Ask for a package price, we can tailor deliveries to suit any situation. 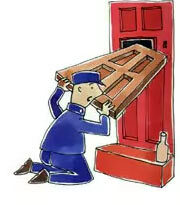 Online orders can only be delivered to UK mainland addresses. To enquire about overseas shipping, please contact us directly. When you place an order we will get in touch with you to arrange the delivery day & date.